Many people hate the idea of networking. It can feel inauthentic, manipulative, and self-serving. Yet developing a strong network can be vital for career success, both in the academy and beyond. People in your network are potential colleagues, co-authors, mentors, recommenders, and maybe even friends. Actively creating a network doesn’t have to feel phony. Here are some tips and resources to improve your networking experience and effectiveness. Network authentically. You don’t need to be a schmoozer, you just need to find people with common interests. Seek out UW alumni on BadgerBridge or find a professional association that suits you. Demonstrate that it’s not all about you. An informational interview can help you understand your career trajectory as you ask contacts questions about theirs. Your interviewees will appreciate your interest in their work. Follow up. Once you’ve made a contact, don’t let that relationship wither on the vine. Online networking sites like LinkedIn can help you to stay in touch. Try to bring something of value when you reach out, like an interesting article. 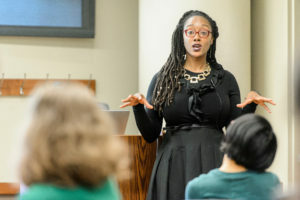 For more advice on connecting with others and networking genuinely, watch the video below from the Graduate School’s networking workshop with Dr. Torsheika Maddox, or read the transcript.